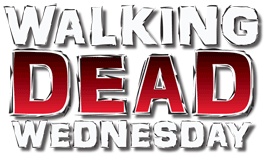 Okay, confession: the RV Walker reviewed for last week's Walking Dead Wednesday was actually the fourth figure I found - I wanted to save this one for last, as a surprise. "This one," of course, being your favorite racist cracker, Daryl Dixon. Well, he may not be as openly racist as his brother Merle (he wasn't a total pantload to T-Dog, for instance), but he does still have the Schutzstaffel "lightning bolt" logo on his bike, so it's not like he's a good guy. Yes, the writers have begun to redeem him, but he was undeniably angry Southern trash when the show started. The only reason the group tolerated the Dixons was because Daryl's survivalist tendencies made him useful. 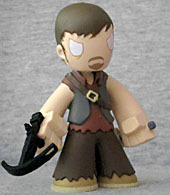 The Walking Dead Mystery Minis were designed by Reis O'Brien, and he did a great job capturing the look of Norman Reedus (in his second comicbook role) in this line's super-simplified style. There's not much of a likeness to speak of, but this one is more identifiable than Michael Rooker was. It must be something to do with the spacing of the (painted on) eyes or the squared-off shape of the jaw. Maybe the way his hair is plastered down against his head? Who knows. The goatee is a bit of a surprise though - it generally looks more like thick stubble than a purposeful beard. 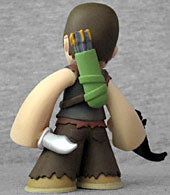 Daryl is armed with his trademark crossbow and has a quiver of arrows on his back. He's clutching a large knife in his left hand. His pants and shirt are just as ragged as the zombies' clothes, but his vest is pristine. His skin is actually a shade lighter than his brother's, but since his clothes are darker, he has a nice contrast. The strap around his chest is the same brown as his pants, but it gets a yellow paint app on the buckle. His quiver is green - possibly suggesting camouflage? - and the bolts are grey with orange fletching. The fact that his foot-nubs are two different shades of beige (darker on top, with light soles) makes it look like he's wearing work boots. Very cool! Daryl is packed at the same 1:12 ratio as his brother, but his blood-spattered variant is much rarer; in fact, at 1:144, it's one of the rarest figures in the line (along with the Prison Guard Walker). He's the show's breakout star, so between that and the fact that I already had Merle, I was really glad to find this figure. 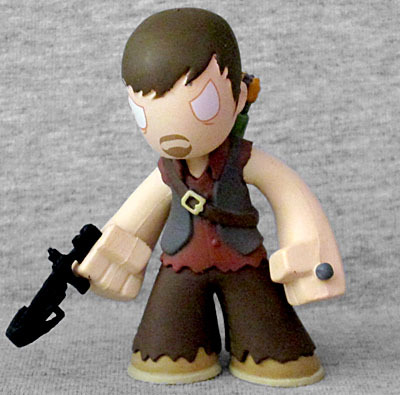 This entry was posted in blog exclusive review, Funko and tagged Mystery Minis, zombies. Bookmark the permalink.